Technical Analysis and Elliott Wave Theory: Elliott Wave Update 30 December 2009 ~ Wave iv already finished? Elliott Wave Update 30 December 2009 ~ Wave iv already finished? 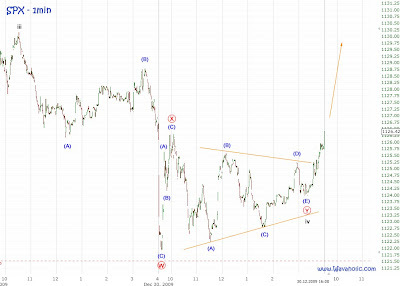 When I posted the triangle yesterday I first thought that this is some part of wave [X]. 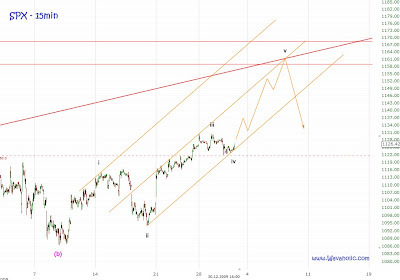 But since the SPX broke the pattern to the upside and not to the downside as expected wave iv might have already finished. A new high today would very likely confirm that wave v started. I expect wave v to end when it hits the middle trendline in early January.